On CRS-16, the landing Falcon 9 booster entered a spin rotation due to a stalling grid fin hydraulic pump. According to Musk, the engines stabilized the spin. How is this possible? The main engines thrust is along the axis of rotation. The side thrusters are perpendicular to that axis but do not exert any rotational moment, as far as I know. 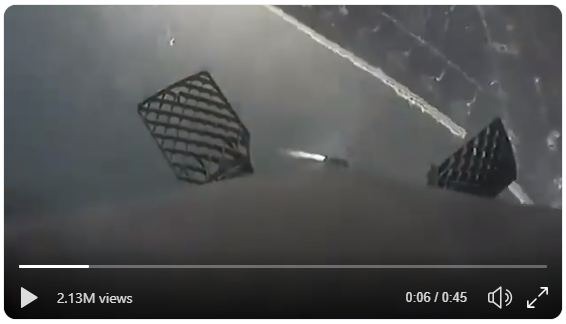 And a side question: the two grid fins in the above video appear to be displaced in favor of a left spin, contrary to the actual right spin of the booster. Is this correct? If so, why aren't they damping the rotation? The other grid fin that is not seen in the clip must be rotated the other way. The other answers are great demonstrations of F9's capabilities, but I'll be the contrarian here and say they're all wrong and perhaps Elon oversimplified things for a tweet. This was a one engine landing burn. A single engine lacks the ability to control roll on its own, unless it has a vectoring turbopump exhaust. Merlin 1C had this feature for roll control on Falcon 1, but Merlin 1Ds on Falcon 9 have fixed turbopump exhausts. The uncontrolled roll was induced by grid fin failure. The landing burn slowed the vehicle, reducing air flow through the fins and lowering the unwanted control input. Eventually it slowed enough that the cold gas reaction control thruster could dampen much of the spin. More rotation was shed when the legs deployed, changing the moment of inertia (the classic dancer putting her arms out to slow). Note that it was still spinning some all the way up to splashdown, so the roll was not stopped, merely reduced. I think Elon was going for brevity on Twitter. The main Merlin engine helped regain control of the vehicle, but it didn't directly kill the spin. The cold gas thrusters (a type of 'engine') did much of the work after the landing burn made the fins less effective. Falcon 9 engines are gimballed, and the landing was to use three. Unfortunately they are ignited only a short moment before landing, so they couldn't be used to maneuver the booster to the landing pad. The most recent Falcon9 landing burns have used three engines (more engines makes for a more fuel-efficient landing, although it also requires a lot more precision). The three are in a straight line, with a center one and two outer ones that can be independently vectored. That allows them to provide torque around pitch, yaw and roll axes. As CRS-16 slowed down, that adverse roll from the grid fin dropped, allowing the engines to eventually overpower it. As to the secondary question: Note that a "grid fin" is a "grid of fins", not "one fin made from a grid": The aerodynamic element is each little piece of vertical grid. As air goes past the grid elements, through the fin, each bit of grid can deflect it. 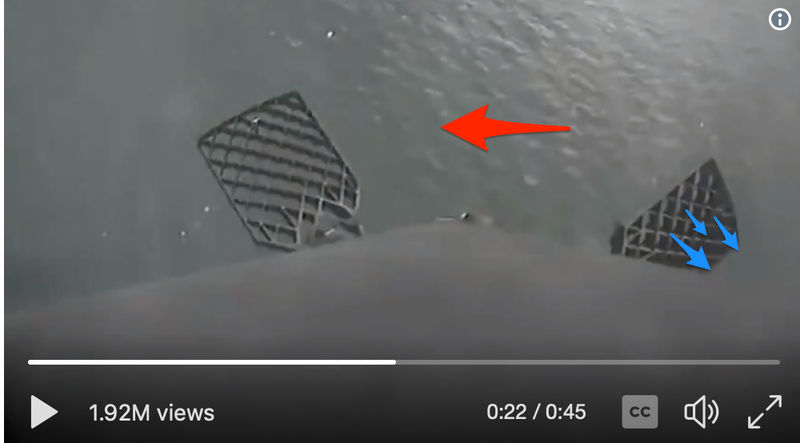 In the orientation shown in the video, the air is deflected right (blue arrows), causing a roll to the left (red arrow). A large proportion of the spin seems to vanish when the landing legs deploy; I think this is a classic angular momentum / moment of inertia problem: c.f. ice skaters. The landing legs collectively weigh 2000kg, and a dry first stage weighs around 25,000 kg: I=0.5MR^2 leads to roughly double the moment of inertia. Presumably the cold-gas thrusters were then sufficient to null out the remaining velocity. As @leftroundabout pointed out, this is a total fallacy. The thrusters necessarily have to remove the same amount of angular momentum. 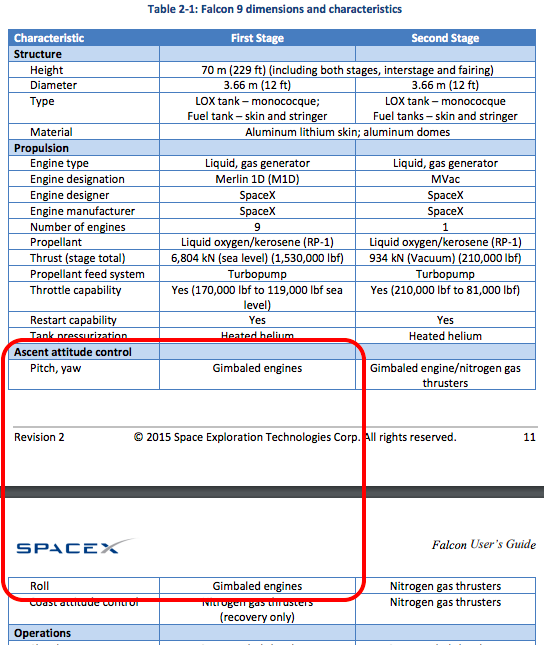 The User-Guide for the Falcon 9 says that pitch, yaw and roll can be controlled by the first stage's gimballed engines, see Table 2.1 on page 11. Any rocket that is built to land has to have full thrust vectoring, since the grid fins or any other aerodynamic control elements only work when the rocket is moving through the air with sufficient speed. In the last moments before touch down, the rocket is quite slow, otherwise there would be no soft landing. Thus, to retain full control of the rocket, there has to be some thrust vectoring for the phases of flight, when the rocket is slow (near the ground before landing, also in the initial phase of lift-off) or the air is too thin for the aerodynamic controls to work. Not the answer you're looking for? Browse other questions tagged falcon-9 landing engines attitude crs-16 or ask your own question. Other than then N-1 (30 engines) has there been a single stage of a rocket with more engines than a Falcon 9? Does the second stage of the Falcon 9 have RCS thrusters? Does a single off-axis thruster firing continuously eventually stabilize attitude gyroscopically? WRESAT spin dissipation system, was it passive or active?